Ay me, things have been busy at the Leonard Pennario desk! We have the University of Southern California including Pennario in a display they are doing of their august faculty. Pennario did not teach there but two of his most famous colleagues, Jascha Heifetz and Gregor Piatigorsky, did. They asked me for a picture of the three of them together, with the violist William Primrose. Then there is a doctoral student at Juilliard who is working on a thesis concerning Pennario's performance of Ravel's "La Valse." It is wonderful that students are beginning to rediscover his work. This student emailed me about her thesis and I am conferring with her on it. I do not know why I think it is a she. The name is Asian so I cannot tell. That round of letters I sent out at the evil Post Office are continuing to bring results. I just heard from the assistant to Pennario's manager at Columbia Artists. I have been wanting to get a hold of her so that is a big breakthrough. Tomorrow is the day I talk with Kaye Ballard! I was over at my friend Gary's house and he was excited at the idea of talking to Kaye Ballard so he played one of her records. It was "Ha Ha/Boo Hoo"! The cover has two pictures of Miss Ballard, one happy and one sad. She is an excellent singer and a great comedienne it will be an honor to converse with her. Kaye Ballard played one of the wicked stepsisters in the Julie Andrews "Cinderella." Here she is in this picture. 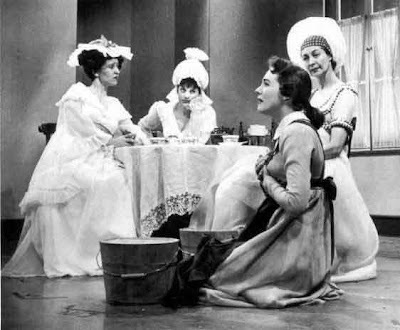 She is second from left. Here is a clip where you see her at the beginning hilariously trying to get the prince's attention. Then the clip goes into "Ten Minutes Ago." What a beautiful waltz that is. You could be corny in musicals back then. You were allowed to be. Now I feel as if my life is a movie, talking to all these people! Except for while they might never come down to earth again, I sure have to, on this rainy Tuesday morning. What is on the agenda today? Is not today the day they are planning some stupid send-off for our Memorial Auditorium? It is a little late for nostalgia, you know? Or, as this goofy German exchange student we used to have used to say: "It is not interesting." You should have heard that in his sleepy, condescending accent. My father nicknamed him Klutz. I feel like calling Klutz on the phone right now, just to hear him say that. Just to hear him say, "It is not interesting." I do not want to see that silly Aud send-off. I want to watch that scene from "Cinderella" again. Yep, it is truly a bit late for the Aud, lol! Kaye was also in "Top Banana" which was written by Johnny Mercer and starred Phil Silvers. Any memories of either (but especially Johnny) would be lovely to hear. I remember Kaye Ballard from the Good Grief Charlie Brown record I had as a child. She was the voice of Lucy Van Pelt. Mary Ellen, thanks for the heads up about Kaye Ballard and Lucy van Pelt. I looked it up in Wikipedia and lo! Mark, I'll ask my new friend Kaye about "Top Banana." Larry, you always crack me up.